Since it's the Easter long weekend here in Australia, that means just one thing - really lazy journalism! And there's nothing lazier than the good old top-10 list. But seriously, since getting my arcade table last year, I've been reconnecting with an awful lot of the old classics - hundreds of them, in fact, and rediscovering just how good these games often are, from both a design and aesthetic point of view. Yes - aesthetics too. It's sometimes good to remember that so many of these retro games have iconic art and design, and the reason for this is not that they were "good for their time," but rather because they are good, full stop. Aesthetics and good art direction doesn't require a game to be hyper-realistic and detailed, and indeed, playing these older games and their simple, clean, minimalist aesthetics is often a refreshing change from modern game design. And so, without further ado, here's my list of the ten best really retro arcade games ever made. And by "really retro" I mean 1985 or earlier. My favourite old arcade game of all time, and right up there with my most played game even today, Space Invaders has become a regular part of my daily routine. Early morning, as I have my first coffee of the day, I'll put this on and spend half an hour or so shooting the little aliens, at which point I'm awake, my brain is refreshed, and I'm ready for the day. 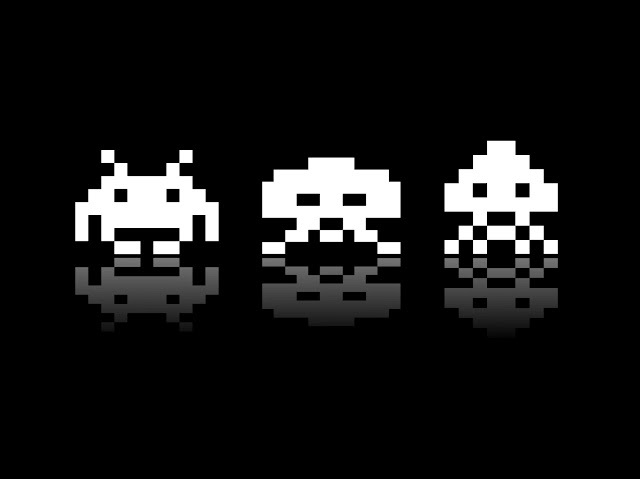 Space Invaders is a masterpiece on every level, from efficient game design, to brilliant aesthetics, an excellent use of music and the game strikes the perfect balance between sheer challenge and the sense of reward from playing well. Truly, there are few games more influential than this one, and with very good reason. Beyond even the iconic design of Pac-Man himself, and the ghosts that chase him around, for me the most important and interesting part of Pac-Man is the level design. The game might only feature a single maze to run around (and therefore there are plenty of other games that offer so much more), but Pac-Man's maze is a brilliant mix of corridors, areas with tight corners, and powerups that make for a game that is endlessly dynamic and exciting. And I really do mean "endlessly" - I played Pac-Man for the first time when I was five or so years old. I'm still playing it today. Everyone who plays retro games has at least one game that just beats them each and every time. For me, that game is Asteroids. I am terrible at Asteroids. I can never seem to get truly comfortable with the movement and inertia of the ship, and the game's demands on precision aiming in 360 degrees seems to be something I'll never truly master. But at the same time it's impossible to deny that Asteroids is an important, valuable, and brilliant arcade game, and congratulations to anyone who is actually good at it - I'll have to play you at Space Invaders to get my confidence back. Taito really was the master of the old arcade. Following on from Space Invaders came all kinds of hits from the Japanese game giant (now part of Square Enix), but of all those games, the one that stands out as second best in my estimation is Qix. Qix is intense, and yet so abstract. You need to "draw" or "cut" into an environment to slowly fill it in so that 75 per cent or greater of the environment is "filled in", while also avoiding a truly menancing sequence of lines - the dastardly Qix - that was moving haphazardly around the environment. This game is maddeningly difficult, and yet that cold intensity and almost complete abstraction made for one very compelling game. The original co-op Diablo-style experience. Make your way through labyrinth with up to three friends, destroying hordes of enemies, collecting keys, and chowing down on the rare bit of food you found along the way, which would add some health to your constantly-diminishing supply. Gauntlet hasn't held up, visually - the aesthetics were never that clean or attractive, and things haven't got better with age, but that four player gameplay will forever be something special. To this day I can play with with family or friends and have a great time with it... even better now that we don't need to keep dropping coins into the machine to re-join the party once we're dead. This might be a controversial choice. There are two old arcade games by Nintendo that are particularly noteworthy - this one, and Donkey Kong. I've decided to go with this one for my list. Why? Because the multiplayer is more enjoyable. Working together with a buddy to clear the levels of enemies was - and still is - one of the most enjoyable of Mario experiences... and as far as retro arcade goes, so much more involving than sitting there waiting for each player to take their turn to simply complete for points. What I really like about Frogger is the way the levels are layered. First you need to navigate your little frog between cars on the road. Then you need to get him across lily pads and logs, drifting across the river (which, for some reason, this particular frog can't swim through). Then finally you need to get him into one of five different "goals." Fill them all up, get a score boost, and then do it all again. Somehow, the subtle differences in how these layers work across the journey made for just enough variety to keep you on your toes. This one is a recent discovery for me, since it's on my arcade table, but was never actually released outside of Japan. Thankfully, western fans can look forward to a new Penguin Wars actually being localised to Nintendo Switch... and that's something that they should be looking forward to, because this game is brilliant. It's like a simple sports game - grab the balls that are on your end of the play field, then toss them at the opponent. Get all the balls down your opponent's end and you win. Have more balls down the other end when the time runs out, and you win. It's as simple as that, and yet the intensity and speed of the matches make this a truly skill-based arcade game that you could spend a lot of time learning to master. Another Penguin-themed arcade game, Pengo is a really enjoyable maze-based arcade game, with the unique twist that the goal is to destroy the maze as you play. See, the maze is made of blocks of ice, and your goal as the penguin is to "push" these blocks of ice so that they slide across the play field and catch - and then squish - the enemies. It was an addictive formula, and because blocks would get destroyed either by pushing them around or the enemy would destroy them, a level would start to get really intense as the available "weapons" started to thin out. Okay, so I cheated a little. Bubble Bobble was actually released in 1986, but it was so close to my cut-off, and such a good game, that I simply couldn't ignore it. In Bubble Bobble, the goal was to capture enemies by hitting them with bubbles created by your character, and then popping those bubbles to defeat the enemies. What made Bubble Bobble so endeering is how cute every darn character is in the game. Every single one.